Buying a car, whether it’s your first car or not, is a big responsibility. It is important that your car offers you good protection from injury in a crash – but it is also important that your car offers good protection to other road users, such as pedestrians, cyclists, motorcyclists or the drivers of other cars involved in a crash. Choosing a safe vehicle may be one of the most important decisions you will ever make. Driving a car that has recognised safety features and a high safety rating is an essential aspect in ensuring safer travel on our roads. Buying a safe car doesn’t mean you have to spend a lot of money or sacrifice the look you want. Below is a guide to help make buying a safe car easier. It’s important to check the safety rating before you buy a car. For new and near new vehicles ANCAP (Australasian New Car Assessment Program) undertake crash tests on cars to gauge the level of occupant safety. New car safety is rated on a star system from one to five stars. Pedestrian safety provided by the car is also rated. For second hand vehicles the Used Car Safety Ratings (UCSR) Buyer’s Guide provides safety ratings for popular vehicle models in Australia and New Zealand. The Used Car Safety Ratings list is derived from reports of actual on-road crashes and represents the ability of the car to protect its driver. The UCSR Buyer’s Guide (PDF, 5879 KB) provides you with the crash safety rating for used cars. You can use safety ratings systems to compare the safety of different brands or models when buying a car. Ensure safety features are given priority when you decide to buy. Even though a safer car will increase your safety in the case of an accident, it is your responsibility as a driver to maintain safe driving habits to prevent accidents occurring. * seat belts designed to work with airbags. 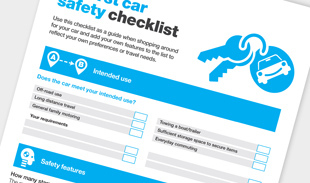 The My First Car Checklist (PDF) is a comprehensive list of safety features to help you evaluate the safety of the car you are potentially buying. You should buy the highest safety rated car that you can afford. 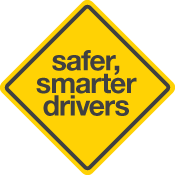 The safer vehicles page provides information on vehicles and a comparison by ANCAP rating. If you are using a family car you should drive the safest car in the family.